Abhyanga is a deeply relaxing oil massage for the whole body. This particular Ayurvedic Massage involves gentle, choreographed, rhythmic strokes using a variety of techniques, including marma point (vital energy centres) stimulation to enhance skin tone and detoxify and revitalise your entire body so to induce deep relaxation. The treatment ends with an equally relaxing session in our state-of-the-art steam chamber, if desired, which helps in releasing toxins. The combination of herbalised oils and gentle warmth make Relaxing Abhyanga a deeply restful and rejuvenating Ayurvedic Massage experience. Vishesh incorporates the classic massage techniques used in Abhyanga but with deeper strokes to clear and detoxify channels of circulation, producing an all-round invigorating deep-tissue massage. Vishesh begins gently before progressing to deeper, firmer and slower strokes designed to release physical and emotional toxins. The treatment ends with a session in our state-of-the-art steam chamber, if desired; further helping the release of toxins. 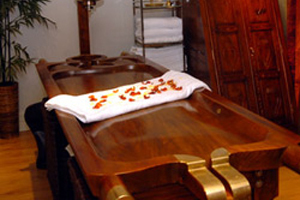 Energising Vishesh is undeniably the more powerful, tension-relieving of the two Ayurvedic Massages we offer.